Partly cloudy skies this evening. Thunderstorms likely late. Low 69F. Winds SSE at 10 to 20 mph. Chance of rain 100%.. Partly cloudy skies this evening. Thunderstorms likely late. Low 69F. Winds SSE at 10 to 20 mph. Chance of rain 100%. 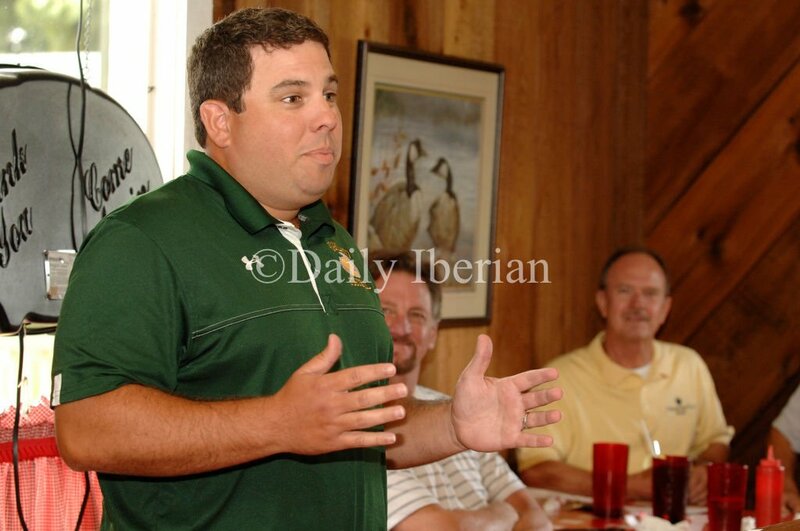 Highland Baptist head football coach Artie Liuzza speaks at the Iberia Parish Sugar Cane Jamboree Coaches Luncheon on Wednesday. 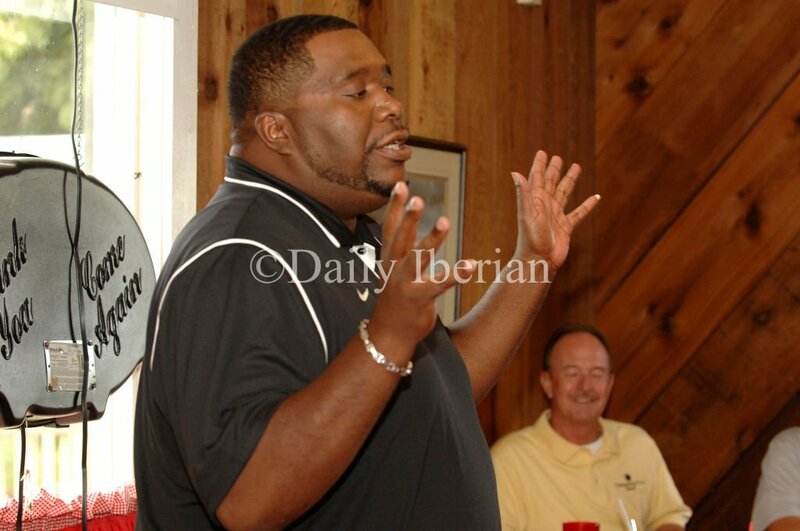 Jeanerette head coach Ananias Johnson draws laughs from the crowd during Wednesday’s luncheon held at Landry’s Cajun, Seafood and Steakhouse. Ryan Antoine of Westgate High School speaks Wednesday. Rob Schlicher of New Iberia Senior High filled in for Rick Hutson Wednesday. Darcey Delcambre of Delcambre High School speaks Wednesday. Trent Delahoussaye of Loreauville talks about his team Wednesday. The newest challenger for the annual “Not-So-Sweet Award” at the annual coaches luncheon prior to the Iberia Parish Sugar Cane Jamboree held Wednesday at Landry’s Cajun, Seafood and Steakhouse made a big splash, earning top honors from among the coaches talking about their teams in his first appearance at the luncheon. Highland Baptist head coach Artie Liuzza drew big laughs with his humorous tales of starting a football program with inexperienced players, and got the highest point total in votes among representatives of the sponsors for the luncheon (Community First Bank and The Daily Iberian) and the jamboree (Coca Cola and The Daily Iberian) from among the six speakers at the event. The coaches for the six jamboree teams present their outlooks for the upcoming season in an understated, humorous way at the annual luncheon. Liuzza was joined by Ananias Johnson of Jeanerette — runner-up in the voting — along with veteran speakers Darcy Delcambre of Delcambre, Ryan Antoine of Westgate and Trent Delahoussaye of jamboree host school Loreauville. New Iberia Senior High athletic director Rob Schlicher substituted for longtime head football coach Rick Hutson, a several-times winner of the award, who was unable to attend Wednesday. Liuzza said a lot of people may not even know who Highland Baptist is, referring to it as “The little school across the bayou.” But he said the experience he’s had at Highland has been unique in a football sense as he and his staff have had to teach the game to kids who’ve never played it before. Liuzza said he was hopeful heading into the season, and wants to put something on the field that the community can be proud of because the school takes a lot of pride in their sports and young people. Johnson thanked band director Safiyy Raoof for keeping his team pepped up regardless of the situation on the field. Delcambre, the defending champion and a three-time winner of the Not-So-Sweet Award himself, let the crowd know that he would follow his usual “truth-be-told” policy for the speeches and stick strictly to facts. “We have 26 kids out,” he said. “It’s about the smallest crew we’ve had since I’ve been at Delcambre. “It’s been a challenge. We’ve been working pretty hard. I think the school board would like to have the type of ratio (in classrooms) we have in football practice. We sat down and figured it out the other day. Our athlete-to-coach ratio is 5.21 to 1. So we have five kids and two-tenths to a coach. So we’re getting a lot of teaching in. Staying healthy is the main concern for the Panthers, he said. Motivation also is a big thing for the coaches. Antoine said he expects Westgate to have a pretty good team, though they haven’t been able to get in much work outdoors because of the weather. “We’re pretty much an arena team right now because every time we’ve got to practice, we have to go inside,” Antoine said. The Tigers lost 24 seniors, and bring back seven on both sides of the ball. Schlicher said Hutson gave him some advice for the speech since he’s won it so many times. Schlicher said Hutson also told him to do what he could to lose, because he lost to Delcambre last year and the Yellow Jackets had a good season. Hutson added that if Schlicher won the award, that would be OK too since he could then blame a poor season on his athletic director. Finding out from defensive coordinator Josh Lierman that the Jackets have four starters on offense and four on defense back from a team that came within a couple of points of reaching the third round of the playoffs last season, he decided to petition the LHSAA to play eight-man football this year. On a serious note, he said Hutson expressed appreciation for the fans and for Schlicher taking his place at the luncheon. Delahoussaye talked about a new kicker, who transferred in from Texas with no football experience but lots of soccer training. The kicker struggled to make field goals in special teams drills, the coach said, and finally after about 10 tries made one, and all the players started cheering. Loreauville has its youngest team since he’s been there, with 18 underclassmen, and will start an eighth grader at quarterback for Friday’s jamboree game against Jeanerette. “You see how it feels, huh?” Johnson shot back. His team started an eighth grader at QB last season and has nine seventh and eighth graders on the roster this year.